Currently viewing the tag: "Power Tools"
So cutting foam rubber isn’t your thing; still, you’ve got to love a tool that has counter-reciprocating blades. The counter-reciprocating action is supposed to cut down on vibration and noise and give you more control for precise cutting of all densities of foam rubber, plastic foams, and even carpet. Made in Germany, the 3.2A motor can produce 3,200 SPM (which I’m guessing means Strokes Per Minute) with no load. The tool operates with a long paddle-type switch and can be locked running. You can change the four different length blades without tools. A few weeks ago I posted a neat, yet overly expensive solution for collecting dust from under the router table. It turns out I overlooked a cheaper solution if you have a Rockler or JessEm router plate or lift. 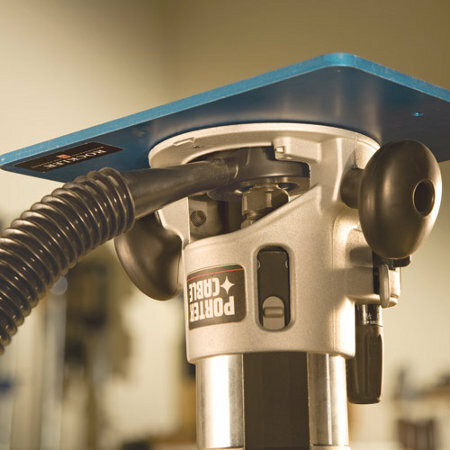 The Rockler Down Under Router Table Dust Port simply twists and locks into the bottom of their new Inter-Loc router plate inserts — no tools required. 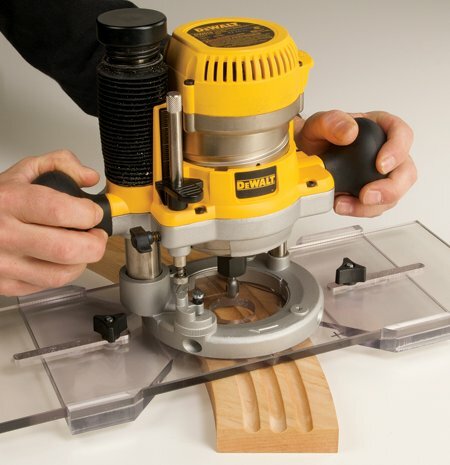 If you’re not using a lift, it’ll fit through the opening of most router bases. If you need to slice really big stuff, you need a really big saw. 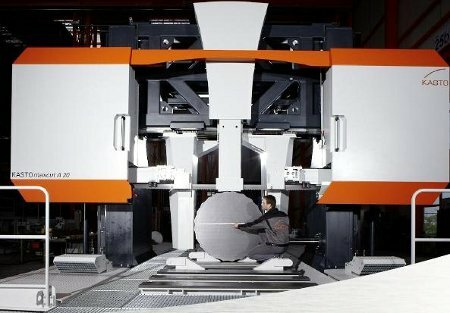 The KASTOmaxcut is a really big bandsaw. Compared to the the person squatting next to it, the blade is thicker most people’s arms and the wheels are almost as wide as a person is high. Many times when you blow a breaker, lose power, or even if the cord just becomes unplugged, you forget to turn off the tool. 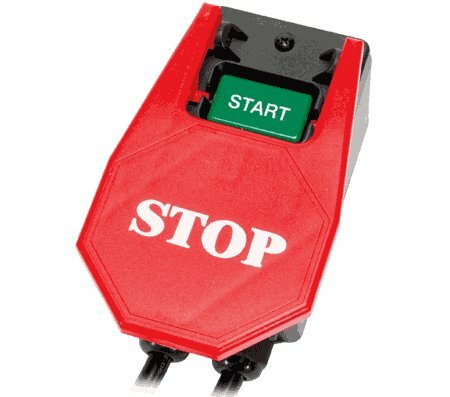 This can lead to the dangerous situation where the tool restarts unattended after you restore power. 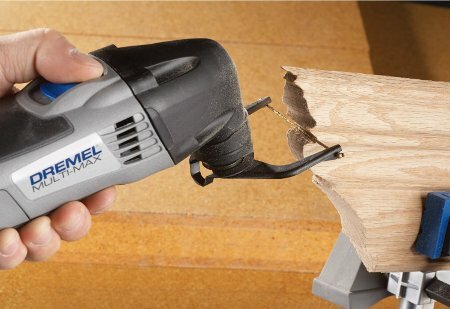 This may not always be a problem, but what if you left stock in contact with a blade or you left the belt sander face down on the table? Most belt-sander races aren’t sanctioned events. Accidentally pull the trigger, set the tool on your bench, and when as you plug the cord into the outlet, you’ve got yourself a track-side seat. 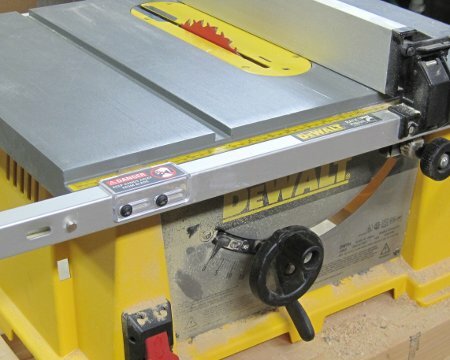 Sanctioned belt sander races are fun, but when an accidental trigger pull turns your workbench into the drag strip, the event ends with a damaged workpiece or trashed tool. 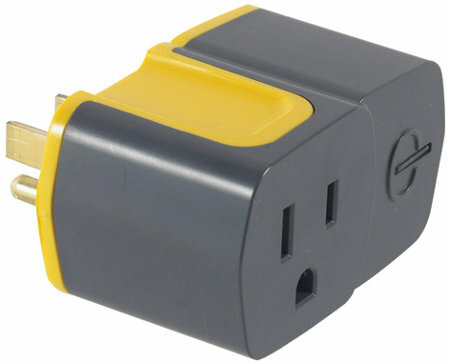 Considering the potential of other tools, it’s easy to imagine how an unexpected start–when you’re plugging it into an outlet, or resetting a blown fuse–can be much worse than an amusing anecodote [sic]. Plug the SafetyGate into the outlet and your tool into the SafetyGate. If you leave the tool on when the power goes out, its patented sensor technology recognizes this and prevents current from flowing to the tool when power is restored. When this condition happens a yellow LED on the device turns on and you need to switch the tool off then back on again to make it work. What’s better than a rotary hammer to power through hardened concrete? How about one that cleans up after itself? 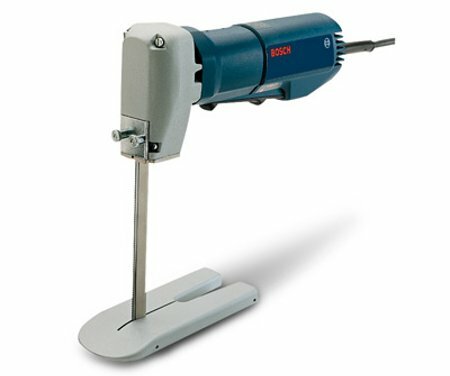 Enter Bosch’s 11250VSRD rotary hammer with dust collection system. The dust collection head telescopes as far as 5″ from the tool to keep it at the point of penetration. The dust collection unit uses a replaceable microfilter to provide “dust free drilling.” With the addition of the dust collection system, the total package weight just 7.4 lbs. If routing flutes into a straight board is what you want to do, a number of store-bought or home-made jigs for your router will help you get the job done, but Eagle America’s Combination Arched Fluting Jig & Edge Guide will also allow you to route flutes on curved or arched pieces. It may not happen often, but sometimes you need to make a cut flush with the edge of your saw — you might be in a tight space or there’s some obstruction in the way preventing you from completing the cut. This is no problem with a hand saw, but it’s almost impossible with a tool like a jigsaw where the blade can be over an inch away from the edge of the shoe. That’s where a flush cut blade like DeWalt’s DW3311 comes in handy. As I was pulling some stuff out of the dryer, I noticed the clothes were actually dry. When it was new, it sometimes took several full cycles to fully dry a load of clothes, but half a year later the clothes are dry before the cycle is over. I started wondering, if a machine like my dryer has a break in-period, then what about my power tools?